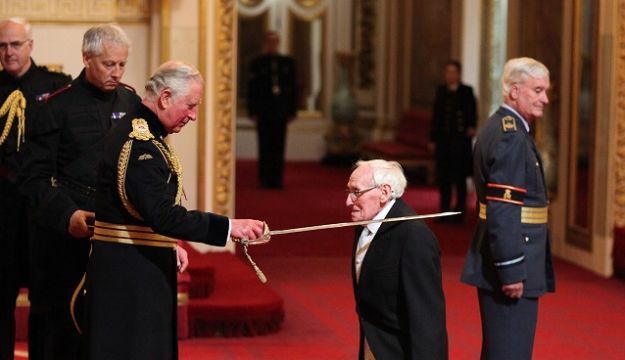 The founder of Wrights Group, Sir William Wright, has been made a Knight Bachelor of the British Empire by HRH the Prince of Wales at Buckingham Palace. Sir William’s knighthood was announced in the 2018 new year’s honours list in recognition of his services to the bus industry and the UK economy. Sir William is a highly respected figure in the UK bus industry as well as in the Northern Ireland business sector and his knighthood is in recognition of a business career that has spanned more than seven decades. In 2001 he was appointed an Officer of the Order of the British Empire for services to industry and the community and he was later promoted to Commander of the Order of the British Empire in 2011 for services to the bus industry. For many years Sir William has been a leading proponent of the development of environmentally friendly technologies, in particular for the reduction of fossil fuel usage and harmful emissions in buses. His vision is to improve air quality in towns and cities in the UK and across the globe. By continuing to take an active role in the business, he has pioneered the design and development of alternative fuel sources for public transport vehicles, including hybrid technologies, electric and hydrogen. Founding the original company with his father in 1946, Sir William has transformed what was a small family business into one of Northern Ireland’s largest employers. Wrightbus now manufactures a range of technologically innovative vehicles that are in service across the globe. The energetic nonagenarian to this day heads up the alternative driveline division at Wrightbus. In 2016 the William Wright Technology Centre – a joint venture between the Wrights Group and Queens University – was named in his honour. The centre continues to promote research and advanced engineering to facilitate the creation and incubation of technologies for the future development of the bus industry.